4 Bedroom Detached House For Sale in for Offers in excess of £995,000. Fulmer is often described as the prettiest village in South Buckinghamshire. There are many beautiful walks and bridle paths in the area including those in nearby Black Park, Denham Country Park, Burnham Beeches, Langley Park and Windsor. roperty is situated on the edge of the popular village of Fulmer which has a church, infant school, Black Horse Inn, and village sports ground with pavilion. 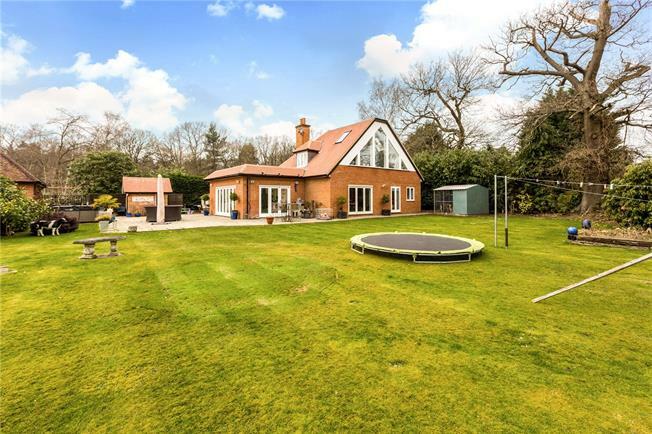 Gerrards Cross is approximately 3 miles distant offering good day to day shopping, two hotels, various pubs and restaurants and the Chiltern Rail Link (fast trains to London Marylebone take 18-20 minutes). The motorway network is accessed at Junction 1 M40 (Denham), linking to M25/M4/M1 and the airports of Heathrow and Gatwick. Receational facilites within the local area are plentiful including golf and 'Spa' at the prestigious Stoke Park club. The property is approached over a gravel driveway leading to the detached garaging. Access to the front door is via a picket fence with pathway leading around the property and into the main garden which is a particular feature with many mature rhododendrons and trees. In all the plot approaches 0.237 of an acre. South Buckinghamshire is renowned for its excellent range of schooling both state and independent - further information can be sourced via www.buckscc.gov.uk, www.southbucks.gov.uk, www.ofsted.gov.uk or www.schools-search.co.uk (using the Postcode SL3 6). Family Bathroom. Outside - 17'11 x 17'9 Garage. Plot 0.237.